The story of Lallie Lennon has been public since 1981, when Lallie spoke, on film, of the ordeal she and her family had been through. 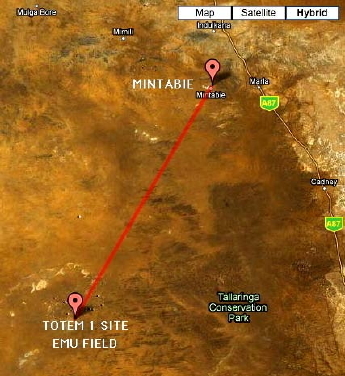 The family was engulfed by a portion of the fallout cloud created by the 1953 Totem 1 atomic bomb, detonated about 180 kilometres south west of their location, Mintabie, where they were looking for opals. In the years since, she has continued to wonder how it was that the skin eruptions she suffers, at first constantly, now more or less cyclically, were caused. Her son Bruce has the same affliction. The two young daughters she had at the time were sheltered under a canvas tent slung over a tree. Lallie and Bruce were out in the open, engulfed by the fallout cloud which snaked through the trees. The suffering has been great. It felt like being “rolled in a fire” and first broke out about two weeks after the Black Mist rolled through their camp. Doctors looked at Lallies’ skin and attempted to treat her condition. When asked, doctors could not or would not give Lallie a diagnosis. That changed in the 1980s, when a doctor in Adelaide did give her his opinion of what Lallie suffered from. This was more than 30 years after the event which Lallie believes caused her suffering. She didn’t suffer the affliction prior to the 1953 event. It first erupted about two weeks after contact with the Black Mist. Beta radiation burn is a common outcome of contact with nuclear fallout. It has been reported since August 1945 in victims of nuclear weapons. From Japan to the Pacific, including the USA, it is an outward affliction suffered by many officially recognised victims from contact with Beta emitting particles. Fission products in nuclear clouds are generally Beta emitting particles. In Australia, it is a condition that has been ignored in regard to Australian victims. In this paper I focus on Beta Radiation Burn, Local Radiation Injury, caused by contact with beta emitting fission products. It is a well known condition. A wealth of information exists describing it detail. The signs of Beta Burn occur about fortnight after exposure. It is a painful condition which may become permanent and cyclic. It may affect skin pigment. Lallie wishes that as many people as possible know her story. I have done my best to take Lallie’s story and compare it with the civil and military records. Records that describe nuclear fallout, what it is and what it does. How it behaves and how it leaves its victims. My training for doing this is basic. During my military service, undertaken in the early 1970s, I was trained as a radiological safety corporal. In that military workplace, which repaired and calibrated radiation detectors, my role was that of a technical clerk. I was trained to monitor the workplace for alpha radiation, caused by the decay of radium into radon and hence into other radioactive decay products. I was trained to use a scintillator based detector for this. I daily charged up and issued personal dosimeters and subsequently read the recorded exposure readings. I received basic radiation safety training. It was nothing exceptional, nothing that could not be taught in High School. My workplace was safe. It was a properly managed facility where the radiation readings I took inside the building were lower than the usual readings obtained outside. Neither were cause of any concern at that time. I was merely trained to consider radiation because radioisotopes, used to test radiation detectors, were present at that now old and closed workplace. I. At the time of their exposure they had no training in understanding ionising radiation, no means known to them to measure it, no understanding that their possessions and clothing would trap and contain the radioactive particles. No-one met them and advised them after the incident. There was no official effort to use the then known principles of Radiological Safety and Health Physics to measure their exposure nor was there any effort to minimise the impact of it after the event. This paper will be submitted to the South Australian Government, the Australian Government, the British Government, the European Parliament and to the International Atomic Energy Agency. I believe Lallie deserves an urgent diagnosis of her long standing condition. A diagnosis made within the context of and in compliance with IAEA guidelines regarding the diagnosis and treatment of Local Radiation Injury – skin contact with Beta emitting substances. Beta Burn to Skin. The diagnosis should be made by suitable Health Physics professionals who are independent from Government influence. There are two editions of this paper. One for Governments and the IAEA. One for general readership. This is because the Government/IAEA text contains two photographs of ground level nuclear clouds: one photographed 100 miles from its tower shot point at the Nevada Proving Grounds, Mercury Nevada. The other was photographed at about 80 miles from that place. These photographs are precious. Copyright permission was sought from a publisher. However, individuals own the photographs. I have chosen thus to provide the photographs only as evidence to Australian politicians and the IAEA. These two photographs are deleted in the public edition of this paper. I urge the general reader to consult the original books in which the photographs appear. These American “Grey Mists” (Nevada Proving Ground soil is a much lighter colour than the soil type found at Emu Field, the place where Totem 1 and 2 were detonated in 1953) represent to many Americans a similar profound sorrow and mark the same process of official denial and battle by victims as experienced in Australia. Both photographs were taken in 1953. This paper is my best effort. I remain focussed on External Hazard due to skin dose. This enables me to concentrate my report on one factor in as a precise manner as possible. Lallie and her family, as well as many others, suffered and described, as untrained people, the same signs and symptoms as those which describe Acute Radiation Syndrome. Radiation Sickness. I make no apologies for my focus. I leave it to others skilled in the understanding of the culture, language and meanings of Australia’s First Nation to further examine this paper. The information presented here must be explained in the light of a full understanding of Aboriginal culture and with further descriptions of the full range of symptoms and effects suffered by many Aboriginal Australians impacted by the British Nuclear Tests in Australia. Beta Burn due to external contact is but one of these. I am moving one step at a time, as carefully as a I can, as I have done since I first heard and saw Lallie in film. I am grateful to Lallie for talking with me and for giving me permission to continue to walk along the songline, a songline which is, as I attempt to show, technically correct, in a most sophisticated manner, when compared with the texts prepared for people who are trained to fight nuclear war. In October 1953 there was a “Friendly Fire” incident. I do not know how many others there were. The impacts are officially denied still. I thank Michele Madigan for her endless patience as she acted as the interface between two worlds. My own and Lallie’s. I ask the reader, if my world is too remote, too hard to understand, just read Lallie’s words. They are sufficient and always have been. To those in power who hold the evidence, they are a proof and an indictment. Paul Langley February 2010 Port Willunga South Australia. News of the disaster was broadcast around the world. On the 23rd of March 1954, the BBC screened film footage described as “local fishermen are being treated for radiation burn.”  The footage appears to show the beta radiation skin burns suffered by the crew of the Japanese fishing vessel “The Lucky Dragon”, which was about 70 nautical miles from blast point. The Marshall Islands were over 100 miles distant. The Beta Radiation Burns suffered by the people were photographed and widely reported. The condition was well known and described in many books. I shall refer to some of these texts in a later section. Certainly the Pearson documents admit to the effects of beta emitting fission products from bomb fallout on livestock in Nevada and Utah in 1953, and Cronkite highlights the relevance of the resultant beta burns inflicted upon the US livestock to the Beta Burn skin lesions suffered by the people of the Marshall Islands in March 1954. The common feature is not the bomb type, but the biological effect noted – Beta particles on skin and hide produce Beta burns, whether from tower shot low yield fission bombs or high yield fission fusion devices. The same effects were noted by Cronkite. All nuclear weapons detonations have well documented and predictable health consequences as described in “The Effects of Nuclear Weapons”. Compiled and Edited by Samuel Glasstone and Philip J. Dolan. The Royal Commission referenced this text in its description of the technical aspects of nuclear detonations and the formation of fission products. The British bombs were late arrivals to the nuclear club and were not unique in principle. They produced fission products as described by Glasstone et. al. The complex techno-politico-medico setting of the Royal Commission attempted to reconcile the eye witness accounts of victims with its own amalgam of what occurred from a model based technical reconstruction. I shall study this dichotomy in a later section. Lallie Lennon and her family are primary witnesses to this Australian event. It occurred in the isolation of the Australian bush a mere 5 months prior to the Castle Bravo disaster. Unlike the later event, the Black Mist event was not covered by the press at the time. That press coverage would not commence until many years later. However, the witnesses continued to suffer, remember and report their experiences. The Black Mist was a persistent individual and cultural presence within sections of Australian society. For example see the Adelaide Advertiser, front page, Monday, May 12, 1980, “A-Test ‘Mist’ May have Killed 50”, by Robert Ball and Peter De Ionno. Despite such official denials the stories of the events of October 1953 continued. Witnesses such as Yami Lester continued to speak of what was seen and suffered as a result of the Black Mist from an atomic bomb blast. Lallie Lennon has spoken consistently for decades of how the Black Mist engulfed her family and of the suffering experienced since. I learned of Lallie and her experiences from watching the film “Backs to the Blast, an Australian Nuclear Story”. The film had been produced and directed by Harry Bardwell in 1981. In this film Lallie describes the Black Mist she saw. She shows the visible scarring on her skin which resulted from contact with the nuclear fallout. The testimony and visual record of Lallie Lennon as she appeared in the film caused me great distress for I had seen similar skin damage and read similar stories years before, but in relation to Castle Bravo. I have been convinced ever since that Lallie’s experience is similar to that suffered by the people of the Marshall Islands and for similar reasons. In a later section I compare photographs of Lallie Lennon’s skin condition filmed in 1981 by Bardwell and photographed in 2006 by Madigan with photographs taken in the 1950s of Marshall Islanders suffering officially diagnosed Beta Radiation Burn due to skin dose from beta emitters in nuclear fallout. This visible condition is indicative of the potential for other, unseen, effects that also cause suffering and loss. I will show in the following pages the failure of authorities to diagnose Lallie’s suffering in the context of radiation exposure. I will show how this failure is in breach of International Atomic Energy Agency guidelines for the diagnosis and treatment of specific conditions such as Beta Radiation Burn. Map 1. Totem 1 to Mintabie. Made possible by the online services of Google. The time frame, the distance, the weapon, the type of shot, and the witness statements of Lallie Lennon all conform with events reported by eyewitnesses to the effects of nuclear detonations in the United States. These aspects will be examined. The Need to Review History, Advise Government, Inform the Public and Properly Diagnose Australians Suffering Beta Radiation Burns. Professor Titterton’s official pronouncement that the Black Mist Incident “could not possibly occur” is accepted by some sections of the Australian society still. This denial impedes the consideration of radiation in the diagnosis of conditions suffered by people who are victims of the Black Mist nuclear cloud. Photograph deleted from Public Version for Copyright reasons. Please see referenced text for Original photograph. Photo 1 Source: Gallagher, Carole, “American ground zero : the secret nuclear war”, ISBN: 0262071460 Publisher: [Cambridge, Mass. : MIT Press],1993. Pp 116 -117. This photograph is deleted in the public edition of this paper. The photograph is copyright and must not be reproduced from the government and IAEA editions of this Paper. A photograph of a Grey Mist type nuclear cloud (colour type due to Nevada test site soil type), traversing ground at Warm Springs, 100 miles from the Nevada shot point of the bomb detonation from a tower. The photograph was taken by Joe Fallini Snr and supplied by Martha Bordoli Laird to Richard L. Miller in rural Nevada. To obtain the photograph Mr Fallini placed his camera in a lead lined camera box to shield the film. Witnesses reports of the Black Mist ground level nuclear bomb at distance from the site of the cloud’s point of origin in Australia in October 1953 are therefore not unique. Lallie Lennon was about 180 kms or 112 miles from the shot point of Totem 1. (See Map 1.) It was not the only similar cloud event to occur in Australia. As the Fallini photographs show, it was not the only ground level nuclear bomb cloud in the world. Lallie’s observation of the Black Mist occurred at a distance from the Totem 1 detonation point that is similar to the distance of the Warm Springs “Grey Mist” from the shot point in Nevada. This was photographed by Joe Fallini Snr in 1953 and published in Miller. There are colour variations in the ground level and other nuclear clouds around the world. In a later section I describe these differences in the light of the descriptions and explanations provided by technical military documents declassified in 1981. Briefly, they are due to soil type present at each tower shot. I am not aware of any consideration by the Royal Commission of the relatedness of this testimony at 80 miles from shot points, to the testimony of Lallie Lennon at a distance of about 112 miles from shot point. On reading Lallies’ oral histories, one is struck by the similarities. These similarities are reinforced by the Pearson memos confirming widespread beta burns suffered by mammals vulnerable to the open air. The Royal Commission did find that: “There was a failure at the Totem trials to consider adequately the distinctive lifestyle of Aborigines and, as a consequence, their special vulnerability to radioactive fallout.”  However, it did not define specific outcomes. As the information provided by Cronkite (1954) and Pearson (AEC, 1953, repeatedly) shows, one outcome from contact with fallout from nuclear clouds is beta radiation burn to skin. (See Sources 7 -12). In the 1950s Pearson specifically addresses beta burn to cattle from contact with nuclear fallout in the US in official memos. The cattle skin turned white. The Royal Commission appears ignorant of the evidence. The skin damage to livestock and the sore eyes the family suffered in Nevada in 1953 conforms with the testimony of Lallie Lennon and others who suffered the same effects in the Australian bush in October 1953. The Royal Commission sought out US nuclear test information in relation to fallout cloud contact . Surely the Royal Commission was aware of the nature, causes and factors of enhanced vulnerability pertaining to Beta Burn to skin. In 1980 a US House of Representatives Subcommittee reported “The (US) Government’s program for monitoring the health effects of the tests was inadequate and, more disturbingly, all evidence suggesting that radiation was having harmful effects, be it on the sheep or the people, was not only disregarded but actually suppressed.”  Certainly in Australia the diagnosis and monitoring of Lallie Lennon and her family and of all other such witnesses since 1953 has been of a like standard. Had the Royal Commission applied available US evidence to the Australian experience, a sensitivity to and awareness of the probability of beta burn to the skin of vulnerable people would have been recognized. Had the Royal Commission investigated the unused photographic film Lallie Lennon had with her when she was engulfed by the Black Mist, the means to determine external dose would have been present. Had Lallie Lennon’s skin condition been diagnosed within the context of Health Physics principles developed over decades, the Royal Commission would have had a means by which to determine dose received. The Commission’s statement of belief stems from ignorance due to omitted evidence. One outcome of this chain of events has been the failure to diagnose Lallie Lennon’s skin condition in accordance with Health Physics principals established by the IAEA. Australia is a signatory to IAEA directives, guidelines and procedures. Belief, no matter how worthy, is not legal proof. While comforting, belief is not able to act as a legal remedy for those who have suffered. This is tragic as evidence was ignored in my opinion. Many Aboriginal people stood before the McClelland Commission and its assembly of Health Physics and nuclear weapons experts from England and Australia. These experts were uniformly mute on the matter of Beta Radiation Burns. This silence has been maintained by authorities to the present day. One wonders why, for we shall see, the US government technical publication by Glasstone et al, “The Effects of Nuclear Weapons”, provides relevant photographs and descriptions of the condition in its Chapter 12. However, the Royal Commission cites Glasstone et al in regard to technical aspects of fission bomb detonations. The publication is used as a source that provides a description the processes of nuclear detonation. One of the people who appeared before the esteemed and qualified experts in 1985 was Lallie Lennon. This was 32 years after the events described and 4 years after her appearance in film. Lallie’s oral histories follow. I will compare Lallie’s statements with military documents dating from 1948 up until the declassification date of 1981. I will also compare Lallie’s description of her injuries with current civilian Beta Burn medical information as provided by the US Centres for Disease Control and the International Atomic Energy Agency. Some of the information contained within Glasstone et al, 1977, as possessed,  but apparently not referenced in this regard, by the Royal Commission. It is time for an open review of Australian victims of the Black Mist in the light of modern knowledge. Cloud chase planes failed to locate portions of the Totem 1 nuclear clouds. Those portions of the clouds that were located were so radioactive that US B29 aircrews, who chased the Australian Totem 1 cloud, were “aghast”. These US crews were veterans of many blasts. They stated that the Totem 1 The use to which authorities put Lallie’s reports and what was done with her knowledge is of great importance. Lallie saw a secret thing. The protection of the secret was given great care. Lallie has asked doctors for a diagnosis for her condition since the 1950s. Not until the 1980s was one given. That diagnosis was apparently made without reference to the cause of the condition. Where radiation may be present, radiation must be considered in the diagnosis – IAEA. The following transcripts of Lallie Lennon’s words show that no warnings or protective advise were given. They reveal the time span from exposure to anything approaching “decontamination” – removal of the radioactive particles from the body, particularly the hair, finger nails, and other parts liable to collect and retain it. Protective measures were known by authorities. A Transcript of Lallie Lennon’s statements included in the film “Backs to the Blast, An Australian Nuclear Story”, produced by Harry Bardwell, 1981. Lallie observed that “grey and blacky sort of dust” had been deposited on the tent, and that she and her son, Bruce had suffered skin trouble that was present on their return from their camp. After a period of time, the skin condition then changed to that of an outbreak that had spread, “coming all over the body”. A Transcript of an Interview with Lallie Lennon and Michele Madigan, Port Augusta, May 2006. A follow up editorial interview took place on 31/12/09 at Port Augusta. Transcribed by Paul Langley 26.5.06. Amended and corrected Jan 2010. The knowledge regarding the effects of radioisotopes, first studied by doctors such as John Lawrenc, Stone and Hamilton in the 1930s and 1940s, was applied to the prediction of the effects of atomic bombs by Groves, Compton, Stone and Hamilton, predictively from from 1942, and actually from 1945. The suffering experienced by the victims of the 1953 South Australian Black Mist Incident was foreseen . The true nature of the suffering inflicted remains supressed today. It is very surprising that although similar events in other parts of the world have resulted in acceptance of the reality of Beta radiation burns, this external marker of suffering and harm is ignored by organisations and government in Australia. This entry was posted on April 20, 2010 at 12:53 pm and is filed under Uncategorized. You can follow any responses to this entry through the RSS 2.0 feed. You can leave a response, or trackback from your own site. Congratulations on this thorough and detailed account of your research into the Black Mist, and Lallie Lennon’s witness to this experience. This is an Australina national shame – the treatment of those aboriginal people, and others, who were subjected to the effects of atomic bomb testing in South Australia. While the Australian government and nuclear physicists are happy to wait until all the South Australian atomic victims have died out, fortunately their case is now being taken up in England, with a legal action that has every chance of at least exposing this shameful episode in Australian history. And perhaps even providing some sort of belated justice for the aborigines, soldiers, and pastoralists who were affected. Versions:Official: Contains copyright evidence. Not for release into the Public Domain. Public: Copyright material referenced and described, but not included. Public version may be freely transmitted and copied with acknowledgement. THIS VERSION IS PUBLIC AND MAY BE FREELY DISTRIBUTED. CULTURAL WARNING: CONTAINS IMAGES OF A PERSON WHO IS DECEASED. This legacy is a negative stain upon the nation and it would only be a guess as to the magnitude of impact upon countless individuals and families, dislocated, thrown into chaos, made sick from the hasty and unplanned actions of Britain, the US and I guess Australia which loves to attend most military gigs sponsored by the aforementioned nations. That Paul Langley is describing the effect and listening to the stories is maybe part of the healing process for all – to recognise the ill-effects of nationalistic actions without regard the owners of the land and lore is not just culpible but foolhardy actions, no doubt at the time supported by someones law. This issue like so many covered on this fine news site, highlights the government and corporate blindspot to human and social effect of what on paper may have looked like totally reasonable plans – to a general or a prime minister seeking to drive home the message that we are powerful and capable – or otherwise said grown up boys playing with their toys and being found out later for the mess created. Settlement, Exploration, Pastoralism, Farming, Mining….the list goes on in a very fresh and late chapter of colonial history. For all the trickery of the wicked acts no amount of cash or compensation is an adequate replacement for dignity and respect, and of these successive Australian governments have been found lacking in the truth. Creative and adaptive people survive and people that have lost sight of their gods fight, steal and plunder, perhaps for want of anything better to do. May the lands and people that have suffered be allowed to heal and may the governments and corporations that have acted recklessly either step down, or start showing some respect for country, people and community – on the land that you have taken and for which you have shown little respect. To Michelle Madigan, after reading your story about Lallie’s experience in regards to the black mist of maralinga, I wanted to ask you if you remember my mum Millie Taylor (nee Lennon). She once told me that she too was interviewed by either you or maybe someone else and she too was recorded on tape. I did find a mention of her name at one stage along with Eileen Winfield, Jessie Lennon, Edna Williams, Lallie and a few others in a list but that was all. I would very much like to find out more about her interview. She did tell me some stories where she said she and her parents were also at Mintabie with me and my two older brothers (I was 18 mths old at the time). I guess I just want to find out what she said in her interview. I’ve been searching for it for a long time now, and I need confirmation and closure of mum’s accounts. I too am telling my story about past wrongs committed against my family. My grandmother Molly Lennon was covered in the ash fallout and she lost all memory of who she was. Mum was very upset when she was sent to an Adelaide mental institution where she died without ever remembering her family. She was buried in Adelaide somewhere and to this day we still dont know where. I personally feel that when we do find her all will be revealed as her bones will have a story to tell. Thank you very much for this important information. During my stay in Cobber Pedy and my work at CP Hospital I was allways worried when the dust storms came rolling in from the south west lifting up massive amounts of soil from this contaminated sites. The wrong that has been done to Anangu, not only through the test’s but before and after are without number. Now being back in my native Germany I am bewildered that nobody, nobody ever has heard anything about all this. It is time to tell a story.